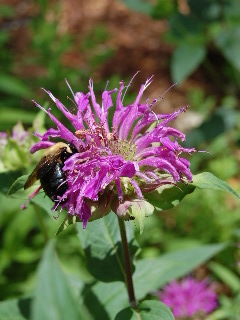 Bee balm is a welcome, easy-to-grow addition to your flower garden. It’s from the genus Monarda, which contains a dozen or so fragrant, herb-like species. The plant itself is of a rambling weed-like nature, somewhat clumpy in appearance. Most species of bee balm are perennials, although some are annuals, and all need plenty of room in your garden to spread and flower. The plants require a loose, loamy, rich, well-drained soil, and need plenty of sunlight in order to produce the profusion of blooms of which they are capable. And, this indeed is the purpose of adding bee balm to your garden in the first place—the showy and colorful blossoms it yields. The foliage is not of a grand nature at all. The plants work well in almost any flower garden situation--rock gardens, borders, clumped masses, or as single units. The blossoms attract butterflies and hummingbirds and, of course, bees—good for pollinating fruit trees or vegetables in other areas of your landscape. The blooms of bee balm are great not only in terms of the wide variety of brilliant colors available, but also for their fragrance. These qualities make them ideal for cut flowers to be brought into the house. Many species of bee balm grow wild in North America, ranging over a large area of the western, central, and southern U.S. The early Native Americans recognized the medicinal value of this plentiful herb. The plants were considered to have antiseptic qualities, and the leaves were made into teas to treat various ailments such as digestive discomfort, fever, and general malaise. If you know the whereabouts of wild-growing bee balm, enjoy it unmolested in its natural state. Never dig or remove wild plants from their environment. Should you choose to add this beautiful flowering plant to your garden (and you should! ), order seeds or plants from reputable dealers such as the Burpee Company or Park Seed Company. 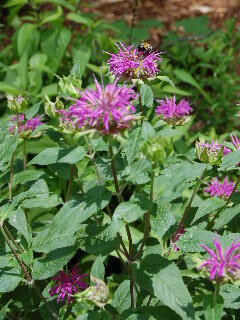 Bee balm is easy to grow and will reward you with an ongoing show of blossoms, butterflies, and hummingbirds.